Samsung will unveil the Galaxy Note 8 on August 23, and it will be the South Korean giant’s first dual camera smartphone. Recently, details about the Galaxy Note 8’s camera have surfaced online. You can read about the dual camera features of Galaxy Note 8 here. We’re three weeks away from the official unveiling of the Galaxy Note 8 from now, and here’s our first complete look of the device from both from and rear, for the first time. All these days, case maker designs of the Galaxy Note 8 have leaked online, but now, a high resolution render of the smartphone has been leaked, courtesy of Evan Blass. The newly leaked render suggests the same design as the case makers design. The exciting part with this new render is the presence of Samsung S-Pen. 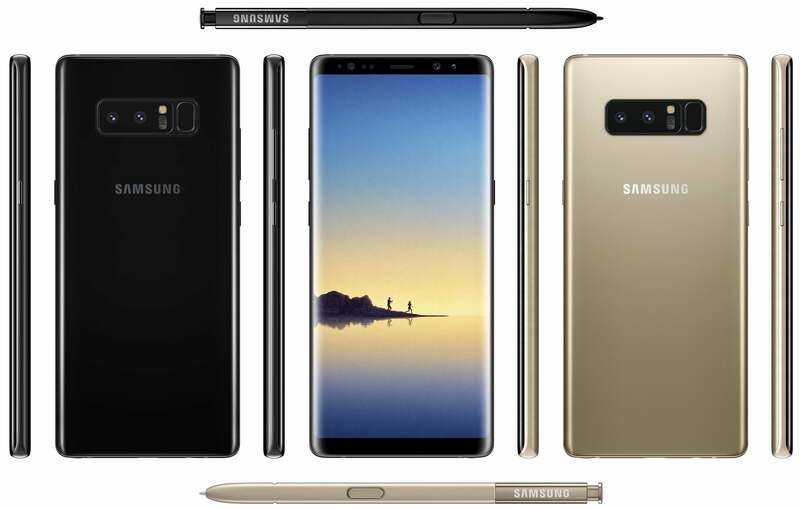 The Note 8 will come in various colour options, but the render reveals the device in Black and Gold colours. As expected, the Galaxy Note 8 will sport a 6.3-inch QHD+ display, same as the Galaxy S8 duo, but the design of the phone is more rectangular than the Galaxy S8 lineup. There’s a big debate going on the internet regarding the rear design of the Note 8, and this render will clear the air. The Note 8 sports dual camera setup at the back, followed by a dual-tone LED flash, heart rate sensor, and a fingerprint sensor. And yes, the fingerprint scanner position seems to be a lot better than the one seen on the Galaxy S8 and S8+. The only flaw with the design of the Galaxy S8 series is the awkwardly placed fingerprint sensor, which is out of reach. The Galaxy Note 8 will have a dual curved display, as expected, and will have support for Samsung S-Pen, which differentiates it from the Galaxy S8 series. Internally, the Note 8 would be powered by the Snapdragon 835 chipset (for some markets) and Exynos 8895 chip (for some markets). Thankfully, Samsung is looking to add 6GB of RAM for the base variant of the device as well, which will be a welcome move. There could be two 12MP sensors at the back with support for Optical Image Stabilisation (OIS). Rumours are rife that the phone will sport a better 16MP front-facing camera to compete with other phones in the segment. Besides these features, the Note 8 will have other features such as IRIS scanner, heart rate sensor, USB Type-C port, NFC with Samsung Pay support, etc. Lastly, the price of the phone is claimed to be around $900, a premium Samsung smartphone till date. The device will reach the Indian market right after the global launch. Reliance JioFi Offer vs. RCom Wi-Pod Offer: Which One Should You Choose?